Its the perfect location for the museum, parks, cafes, pubs, restaurants, theatre and cinema! Online bookings are limited to 6 people: email us if there are more than 6 of you so that we can take you through our group booking procedure: otherwise check in cannot be guaranteed. 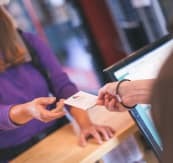 Photographic ID or HI membership card is required from everyone checking in: this is held at reception until check out. Check in starts 13.30: Check out before 11.00. Hostel quiet time: 23.00 to 7.00. Breakfast is not included, but may be purchased on the ground floor. Free WiFi is available in common areas on the ground floor. We also have coin operated kiosks for internet access at 1 per hour. Payment is required on arrival in cash (GBP only) or by credit/debit card. We do not accommodate stags, hens, sports teams (apart from school teams) so that we can provide a quiet, comfortable and relaxing place to spend a night or 2. 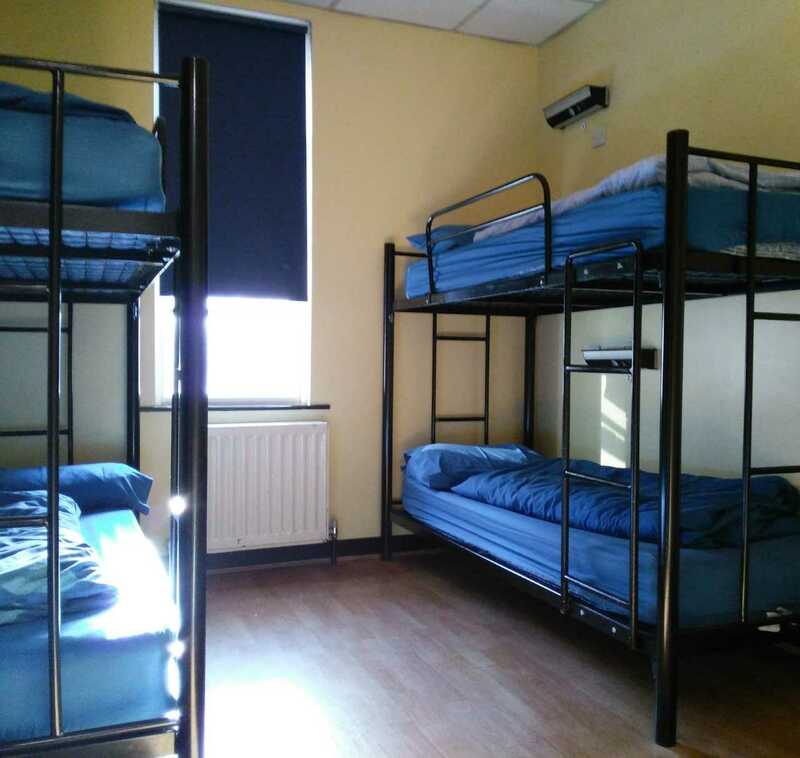 Belfast's biggest, longest established hostel: no gimmicks, just clean, safe accommodation. 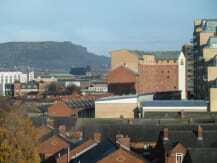 Its a perfect base from which to explore the city and its history, ideally located for a walk through the university area, along the river to the ever-changing waterfront and Titanic Quarter, or to the shops in the city centre. 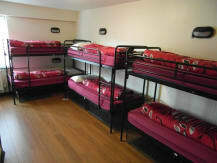 We have rooms to suit all budgets, from a basic cheap dormitory bed to a double with private shower/toilet. We embrace the hostelling ethos so expect to make your own bed: the TV is in the TV room: the kettle in the self-catering kitchen! 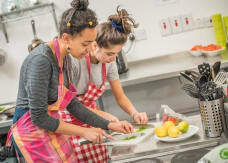 Our self-catering kitchen is fully equipped and open from 6.00 to 10.30 and 12.30 to 23.00. There is a plentiful supply of hot water during the day, and our central heating is on from 7.00 to midday and 19.00 to midnight (the building is not heated during the summer months). We have a secure car park which is free of charge. There is a luggage room: this is also provided free. Standard twins are small (half the size of a standard 4) and designed for those seeking a budget room but some privacy, not extra space or comfort. Furnishing, floor covering etc varies from room to room. The building is No Smoking in line with the law in Northern Ireland. We can book your black taxi tour for you at the hostel reception desk. 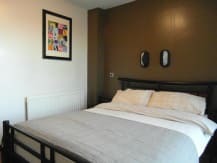 Let us book your next HI hostel for you! 'No shows' are charged for the first night of their stay, less the corresponding deposit amount for that night. Online bookings for groups of more than 6 people are not permitted (including those made on different websites and in different names). 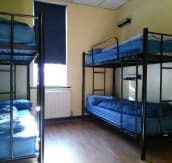 To book for a group (schools, universities, church groups etc) please contact the hostel directly to make your reservation. Student groups should be accompanied in the hostel by a teacher/tutor during their stay. Hostel management reserves the right to refuse check in. 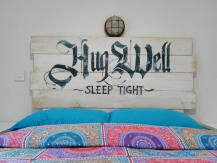 Respect and consideration for staff and other guests is expected at all times, particularly during the hostel quiet time: anyone causing problems or complaints from other guests will be asked to leave. Alcohol is not permitted in shared dormitory rooms. Families with children under 16: please book a bed for all children travelling with you. 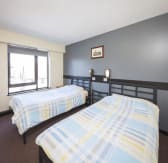 Please contact us after booking to let us know you require a 'family room' as under 16s are not permitted to share dormitory rooms. GROUPS (7 or more people) are not permitted to book online. 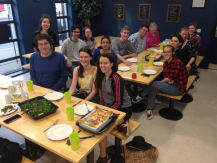 Groups of more than 6 people should contact the hostel directly to book. HOSTEL MANAGEMENT RESERVES THE RIGHT TO REFUSE CHECK IN ON ARRIVAL. PHOTO ID IS REQUIRED FROM EVERYONE CHECKING IN AT BIYH - THIS IS HELD AT RECEPTION UNTIL CHECK OUT. FAMILIES: please book a bed for all children travelling with you. 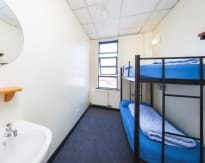 Under 16s are not permitted to share dormitory rooms with strangers: contact us after booking to let us know you are travelling as a family so that all of your beds are allocated together in the same private room. Situated in Belfast's University area, on the Donegall Road, just off Shaftesbury Square. 10 minutes walk from the Europa bus station where the Dublin bus stops, straight down Great Victoria Street. Come out of the Bus Station onto Great Victoria Street. Turn right. Turn right again at the KFC in Shaftesbury Sq. We are on the left, just past the bus stop. 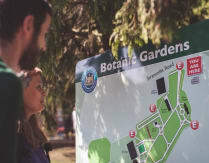 If arriving by train from Dublin, take the connecting train to Botanic station, there is no need to buy another ticket. Come out of Botanic Station and turn right. In the Square you will see the KFC. Walk past the KFC and we are on the left. 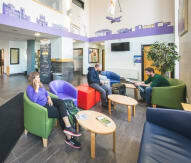 The hostel is located about halfway between Belfast City Hall and Queen's University/Botanic Gardens/Ulster Museum - so within walking distance of most city centre visitor attractions. It is close to the Europa Buscentre for airport transport - and to Botanic Train Station for links to Titanic Quarter.